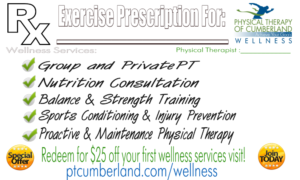 At Physical Therapy of Cumberland, we have the knowledge and experience to guide our patients on the path to total wellness. Our therapists are committed to getting you back to your desired level of function. Utilizing advanced techniques, personalized attention and state-of-the-art equipment, our clinicians design a customized plan of care. In a comfortable and relaxed setting, we are with you every step of the way – encouraging and educating you on how to reach your best outcome. Tom and his entire staff make sure that each patient is treated with 100% of their attention. They create a comfortable and relaxed atmosphere while making sure you achieve your goals. The entire staff at PT Cumberland made me feel comfortable in my therapy. I feel they all had a vested interest in my getting better. They were all friendly and compassionate. This is the third time I have undergone therapy, previously at different locations. PTC was the best by far and had the most qualified therapist that I have ever worked with. Great place, clean and personnel are very friendly. Jess was great! Not only was Dustin a great PT who helped me achieve my goals, but he made this a fun place to come to. I found PT Cumberland to always be clean and organized. The receptionists were both lovely and helpful. Karen was wonderful, she was very helpful in the process of healing. Everyone at PTC made you feel comfortable yet challenged. I have been working with physical therapist David Dansereau at PT Cumberland to improve my balance. He has always been very patient, kind, understanding and very professional. My balance has increased tremendously as well as my overall strength. I would recommend this exercise program to anyone who is considering it. This has been one of the best things that I have done for my health and fitness. My therapist, David Dansereau, was very informative about my exercise and showed me how to do them properly. He has a great personality and made me feel very comfortable and safe. His training helped me to improve my physical well being greatly.